All right! I’ve got my house sitters all set up and my bags (not even close to being) packed! I will be checking email (cheyenneweil@gmail.com), so feel free to message me with any questions while I’m out. About a decade ago I was given this diamond as a not-so-subtle hint by my (now) mother in law. I was excited to make a ring out of it, but after some trying, found the square shape to be rather difficult to design for. Over the years I have drawn several (failed) designs and carved probably five of them. I actually had one cast but then decided I didn’t like it. At long last, I scrapped my frilly and over-the-top designs and went for super simple. But I felt I couldn’t make it smooth and rounded, so I carved edges into the band and bezel. It’s pretty much perfect because I can wear it singly or stack it to my heart’s content and change up my stackers whenever I want. 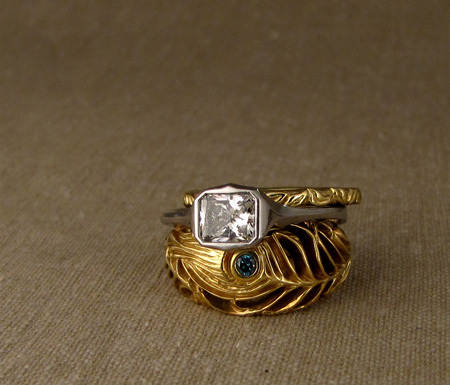 I finally got my ring finished just before Christmas. Just about 20 years after Joshua and I got together. Pretty pathetic for a jeweler, I’d say. 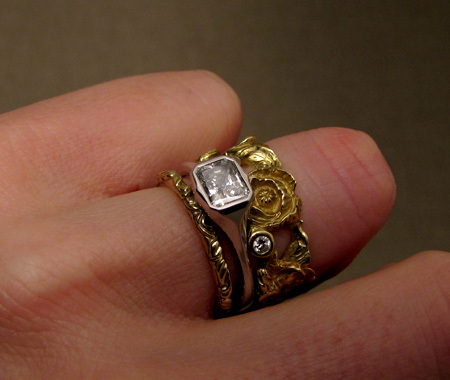 Here’s what I find myself wearing the most: Platinum solitaire with 18K yellow gold Peacock ring & narrow leaf ring. I really like the color contrast between platinum & 18K yellow gold. 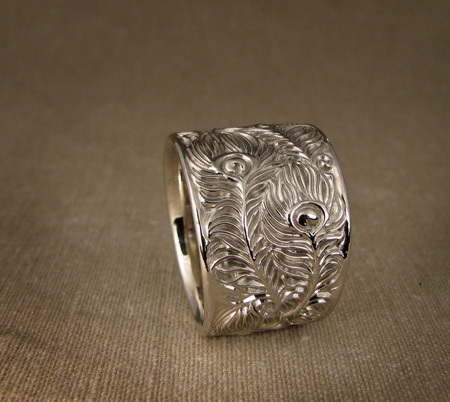 This is a super wide peacock band in 14K white gold. When they asked me to make it 15mm to start, I was all, “How can I be sure that my 15mm is the same as your 15mm?” And I got all neurotic about measurements and details and they came back with, “Well, the ring I wear now is 16mm and it could be a bit wider, so let’s actually go with 18mm!” Whoa. 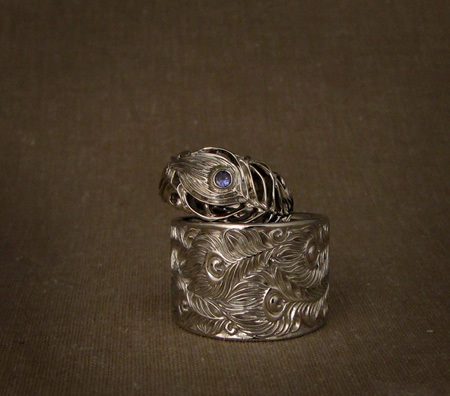 The set: Hers is my original peacock band with a 2.5mm tanzanite stone in the feather eye, and of course his is the wide band. It was a lot of fun carving this ring and it took me forever. 18mm is a LOT of real estate to carve up. I am so very happy with how it turned out. 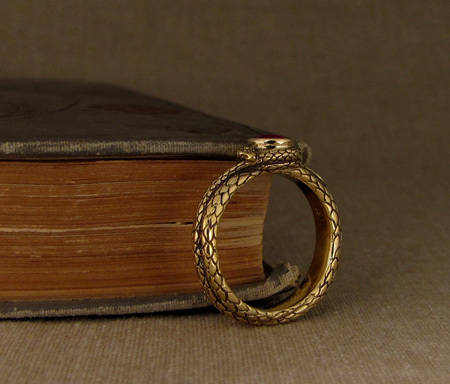 Well, it’s about time I finished this ring. I started it nearly a year ago and had it cast easily 6 months ago. 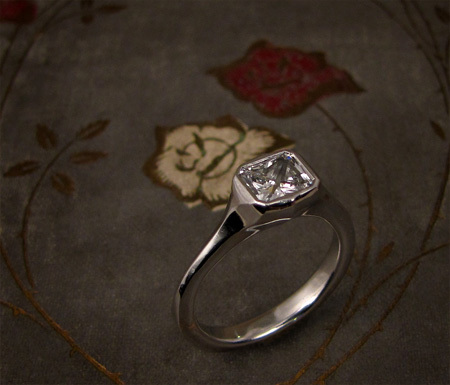 Then I stressed over what would be Thee Perfect Stone to set in the top. Against the intensity of the 18K yellow color and the epicness of the snake motif, I decided that I needed a ruby to go here. Then I couldn’t find one. Well, not one that I liked. 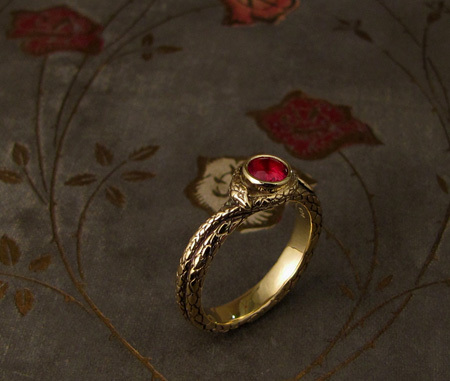 I wanted a really red one that was actually clear inside, which is a hard bargain when it comes to rubies actually. The vast majority of them are a purplish red to downright pink in color, and it’s rare to find any that are truly clear inside. The whole “pigeon’s blood” ruby thing is, in my opinion, some seriously misguided romanticism. I mean, I’ve seen a dead pigeon before. So I sat on it until I went to the Tucson gem show and spent two days on a quixotic search for the awesomest reddest rubies of specifically the right size for my ring. Out of the hundreds of gem vendors and tens of thousands of rubies there, I found three stones I liked and I bought all of them.